In this example clustered configuration, we use a different traffic node selection method. The Paxton Thomas support organization has subscribed to a third-party DNS solution provider. The DNS provider provides hosting for the paxtonthomas.com domain and also has a special offering that allows Paxton Thomas to create a single A record that utilizes their traffic management functionality, which essentially determines where a DNS request should be routed. 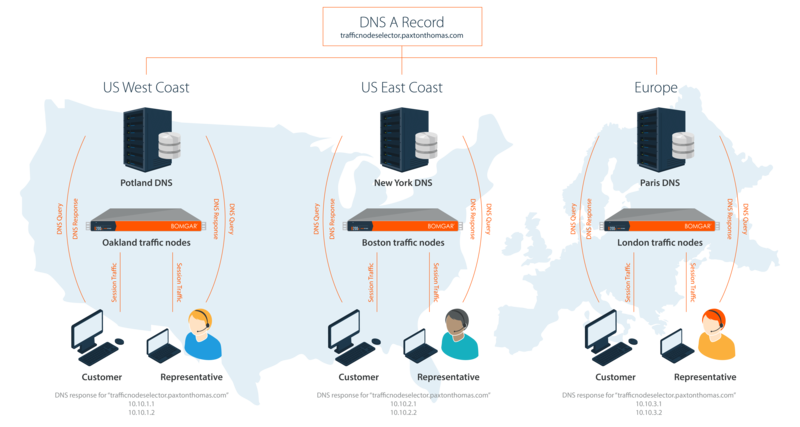 The third-party DNS provider has DNS servers strategically placed in the different geographic locations throughout the US, Europe, and Asia. BeyondTrust creates an A record for the name of trafficnodepicker.paxtonthomas.com and within the DNS management interface specifies the IP address of each traffic node that is in the specific region for each DNS server. For example, on the DNS servers that are responsible for the “US East Coast” region and physically reside in New York, the server resolves the DNS name trafficnodepicker.paxtonthomas.com to one of the two IP addresses for the appliances located in the Boston datacenter. Likewise, the DNS server responsible for regions in Europe and physically residing in Paris resolves the DNS name trafficnodepicker.paxtonthomas.com to one of the two IP addresses for the appliances located in the London datacenter. This traffic node selection process works well. However, it does require more administrative overhead to maintain the DNS infrastructure. Also, there exists a potential for additional cost when utilizing a third party to host DNS. So, when choosing which method to pursue for your traffic node selection process, it is important to consider factors external to your BeyondTrust environment, which may increase cost and complexity to maintain your clustered environment.